At Parkwood Homes, we love helping our buyers custom design and build homes that are one-of-a-kind and truly fit the way their families live. Once you’ve chosen your lot and house type and customized your floorplan, you get to begin the exciting selection process, picking from your favorite appliances, then cabinets, then flooring, countertops and tile. Our buyers love collecting their favorite pics of kitchens, bathrooms, mudrooms, light fixtures, and more from magazines or great websites like Houzz and Pinterest. Not many homebuilders are comfortable with the complexity that this amount of creativity brings to building a home. But at Parkwood, it’s one of the things that makes each home special and our jobs more fun and interesting. 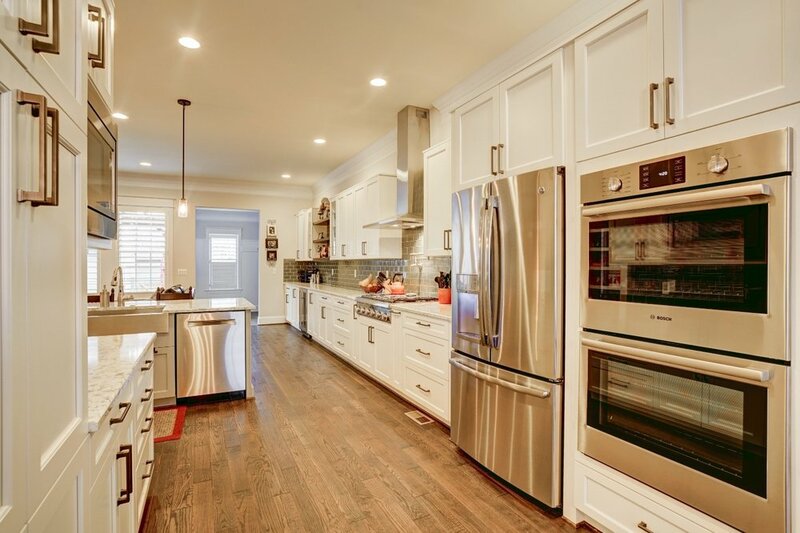 When it comes time to make these finish selections, appliances need to be first on the list, because the size of your range or refrigerator helps determine your cabinet layout. We’ve had some great home chefs and some big families among our buyers, so we see a wide variety of appliances, spanning a wide spectrum of sizes, brands, prices, and capabilities. We know that when it comes to choosing appliances for arguably the most important room in your house, form is often just as important as function. Sometimes you want to minimize the appearance of appliances and want a simple cooktop that doesn’t break up the flow of your counter. Sometimes, however, to highlight the importance and overall aesthetic of your appliances in your kitchen, you need a full range and might even choose bold colors. It was Mario Batali who said, “the kitchen really is the castle itself. This is where we spend our happiest moments and where we find the joy of being a family.” We agree wholeheartedly, and know that it’s important to make this space feel just right. During the planning process of any new Parkwood home in Colorado, you will take a trip to the Builder's Appliance Center (BAC). Before we get into the selection process, here’s a little background on BAC. Founded in 1993, BAC offers the best selection of refrigerators, ranges, washers, dryers, dishwashers, and more in the city. BAC has built their business around guaranteeing customer satisfaction above all else, and it certainly shows when you find out that 85% of their business comes from referrals. When it comes to this point in your process, we’ll introduce you to Paul and Deanne at BAC, who will schedule an appointment with you and be with you every step of the way through the appliance selection process. They have been working with Parkwood buyers for a long time, so they are very familiar with our homes and our custom design process. Their expertise will really show as they ask you to describe your family and your needs so they can tailor their recommendations to fit both your vision and your budget, guiding you through each decision and showing you the effect it will have on the overall kitchen. They’ll show you how getting that built-in refrigerator you’ve been dreaming of will affect the cabinets around it. They’ll help you break down every inch of your kitchen and decide between the sleek Bosch double oven, cook-top, and dishwasher that come standard in every Parkwood kitchen, or perhaps upgrades to a Sub-Zero built-in french door refrigerator or that Viking 48” dual fuel range that you’ve had your eye on forever. Whether you decide to stick mostly with Parkwood’s excellent standard offering or want to flex your culinary muscles with professional-grade appliances, Paul and Deanne will share their expertise and show you a good time at BAC. Once you’ve made your selections and taken the first big step to putting together your perfect kitchen, maybe you’re a bit antsy to see your new steam oven in action. Well, never fear, because Jo Ann Washurn, BAC’s Executive Chef, hosts free cooking demos in their live kitchens almost every Saturday. So not only will you leave these demonstrations with a better knowledge of how your appliances work, but you’ll get a tasty treat and may even snag some great recipes to take home with you. All of us here at Parkwood Homes are enormously proud to work with a company that values quality and customer service just as much as we do. With BAC, we can guarantee a clear, professional, and even fun experience. After you finish with your selection process you’ll be ready to take the next steps at The Kitchen Showcase, where you’ll pick out your cabinets. Make sure to keep an eye on our blog in the coming weeks for more information about them. For more info about BAC, visit their website: www.4bac.com. Don’t have time to get down to the showroom, but still want to take a look at what BAC has to offer? Click here to check out their cool virtual tour that lets you walk around and click each appliance to find out more info about it.